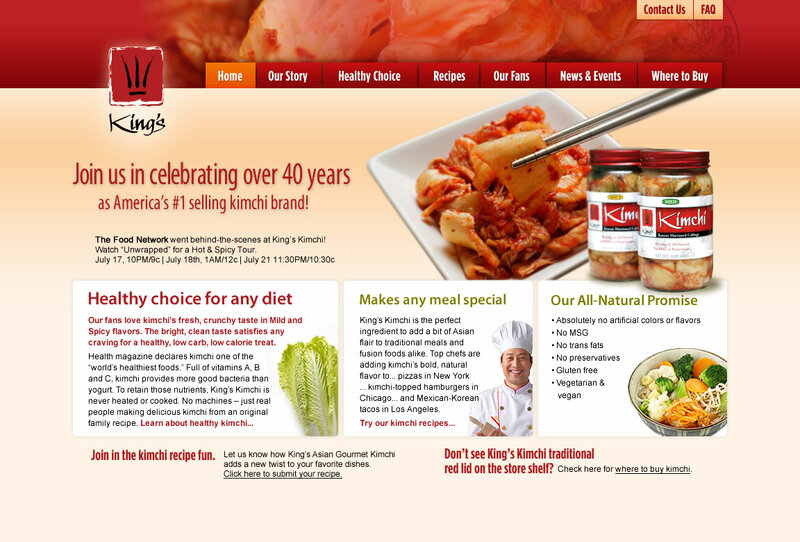 Our Story|Healthy Choice|Recipes|Our Fans|News & Events|Where To Buy|Contact Us|FAQ Join us in selebrating over 40 years as America's #1 selling kimchi brand! The Food Network went behind the scenes at King's Kimchi! Watch "Unwrapped" for a Hot & Spicy Tour. Our fans love kimchi's fresh, crunchy taste in Mild and Spicy flavors. The bright, clean taste satisfies any craving for a healthy, low carb, low calorie treat. Health magazine declares kimchi one of the “world’s healthiest foods.” Full of vitamins A, B and C, kimchi provides more good bacteria than yogurt. To retain those nutrients, King’s Kimchi is never heated or cooked. No machines – just real people making delicious kimchi from an original family recipe. King's Kimchi is the perfect ingredient to add a bit of Asian flair to traditional meals and fusion foods alike. Top chefs are adding kimchi's bold, natural flavor to... pizzas in New York ... kimchi-topped hamburgers in Chicago... and Mexican-Korean tacos in Los Angeles. Join in the kimchi recipe fun. Let us know how King's Asian Gourmet Kimchi add a new twist to your favorite dishes. Don't see King's Kimchi traditional red lid on the store shelf? Check here for where to buy kimchi.